Ermmm, yes, I did say a couple of weeks ago that I'd post these pics. 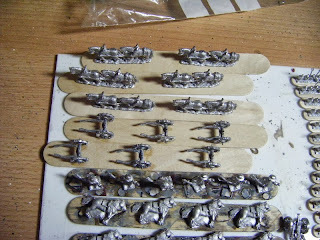 However, it was only yesterday that I got round to spraying them with matt varnish. I might go over some parts with brush-on gloss varnish to make them "pop" a bit. Travelling around the country in the Enigma Engine (Wolsey's psychedelically painted van), these 4 friends and their faithful Great Dane are seeking to find the cause of and a cure for the zombie plague that has devastated the nation. Will they discover what is behind the outbreak and will they get to do the big reveal at the end? Look - just because the zombie apocalypse has arrived, there is no excuse for a girl not to look pretty. And hot pink is always such a fab colour. Barney is such a preppy. Like Felicity, he believes that the apocalypse is no excuse not to look one's best at all times. Whilst most survivors head for the food aisles when searching for supplies, Barney heads for the detergent aisle to ensure he can keep his whites white and his colours bright. Louise is definitely the brains of the outfit, keeping the Enigma Engine on the road, maintaining their weaponry and analysing samples in search of the origin and cure for the infection. Gone is her old form-hiding jumper, out comes the singlet - much easier for cleaning off blood and brains splattered out from zombies massacred by her chainsaw. With the apocalypse having dried up the supply of the active ingredient for his brownies, Wolsey has been forced to face up to the world as it is. Running away from danger is no longer an option so he has hardened up, tooled up and inked up. With his sensitive nose Hamlet is a great boon for the team, being able to sniff out food at great distances and give advance warning of approaching zombies. Like Wolsey, the termination of brownie-ingredient supply has somehow made him more courageous, so the team have fashioned armour to help protect him from zombie bites. These figures from Hasslefree are fantastic sculpts and were fun to paint when I eventually knuckled down to painting them. I think the trick for me is to do them individually - my previous 2 attempts I was doing them all together. 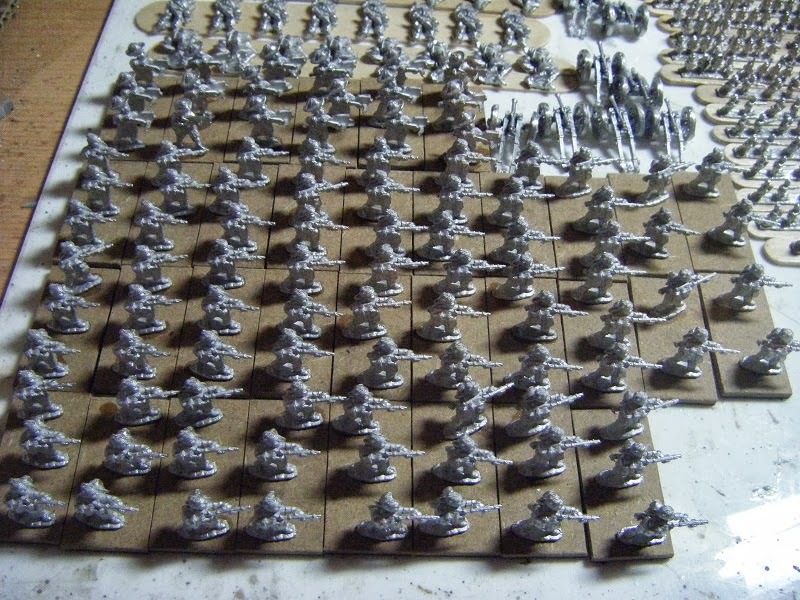 All the figures I prepped last week have now been primed (apart from the regimental guns). 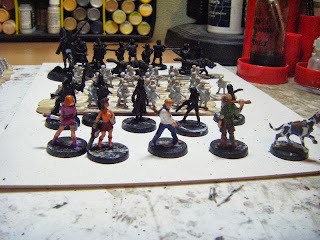 The 30YW figures were primed with grey gesso. For the 6mm I discovered I was almost out of Humbrol matt white, so I bought some white primer from Halfords. 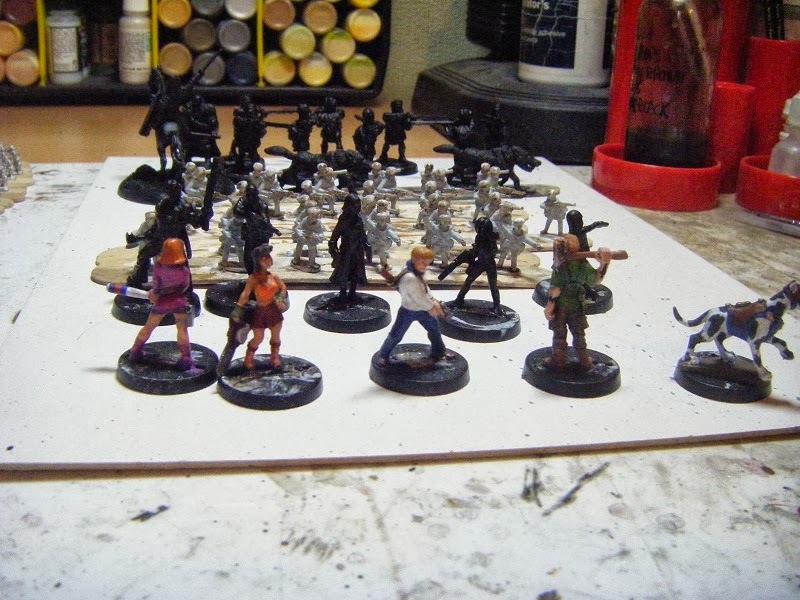 It seems to have worked a treat, although the proff will be in the pudding when I get around to actually painting them. 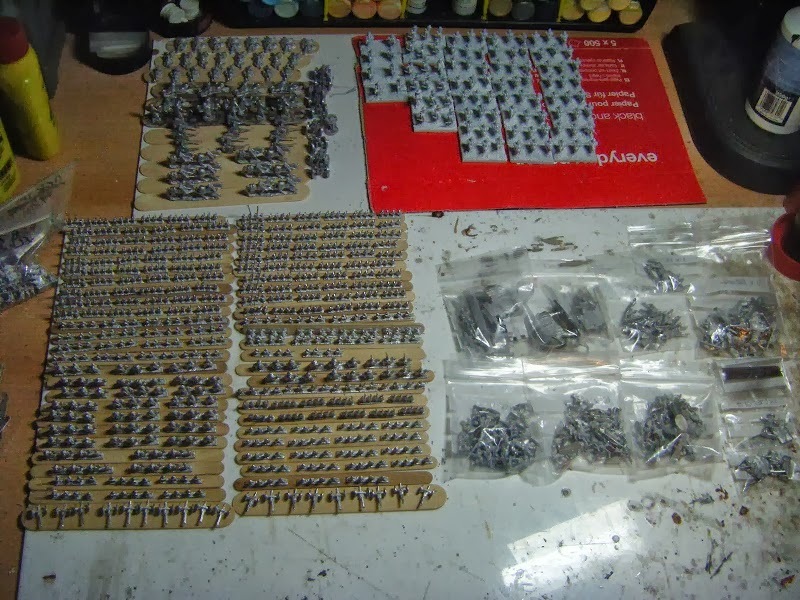 I definitely need to order a few more bits from Baccus (commanders, dismounted cavalry, some more artillery and some casualties) and some bases from Tiny Tin Troops - I've decided to go with 60x60 bases for infantry and cavalry, 30x30 for artillery and commanders. 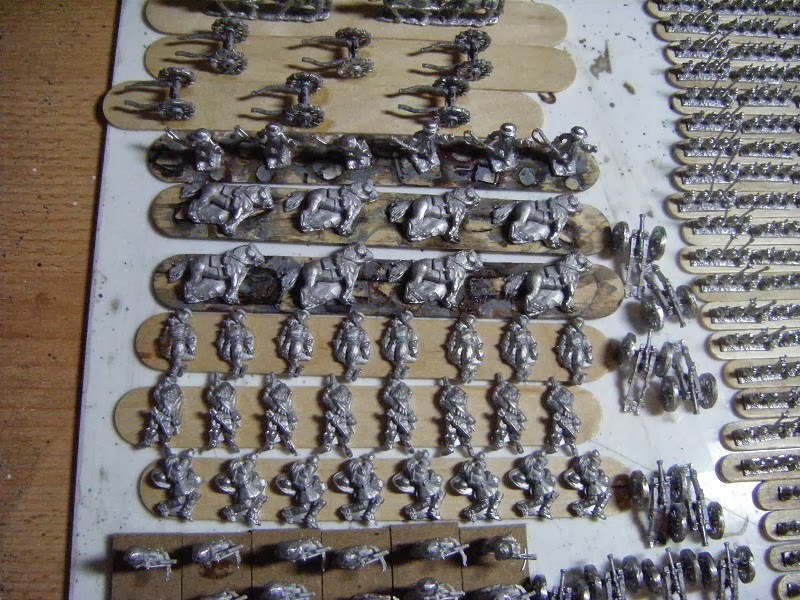 This week, alongside finishing Donogh's figures, I'll be doing more figure prep - the nellies, Xystophoroi and the last of my Sarmatian lancers. "That's unlike her - starting a post with a pic!" 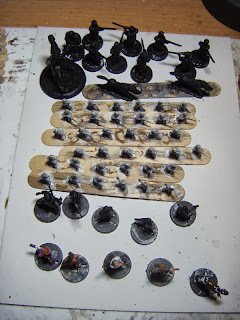 2) All the Union troops have been glued onto painting sticks. 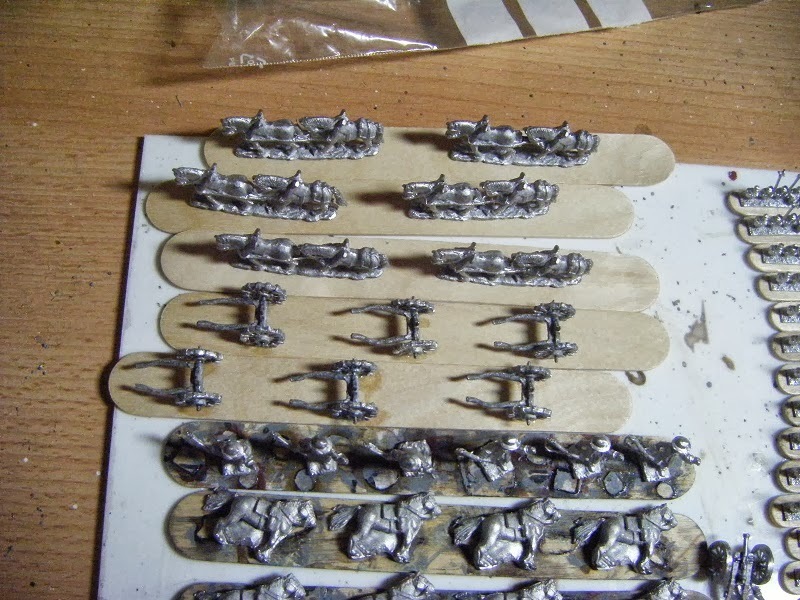 If you look closely, you'll see that the artillery pieces are upside down - that's so that I can prime the undersides. Yes, my order from Donnington has arrived. 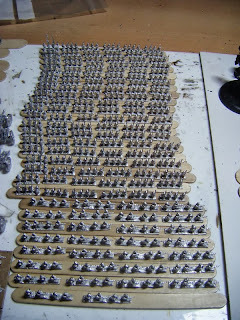 72 halberdiers for my medieval Swiss army. some pikemen as standard bearers for my Buccaneer army as well as 2 elephants and 12 Xystophoroi lancer cavalry for the Seleucid army Simon and I will be taking to Usk (he has the rest of the figures we'll need from his Pyrrhic army). Yes, yes, I know - it's over a week since I last posted. I've just been really tired every night this week. So, what have I been up to over the last couple of weeks? The themes for Usk have been announced and the FoG:AM theme is the Hellenistic Mediterranean, so we can expect lots of Successors and Republican Romans. Simon F and I have decided to go with an early Seleucid army. Richard agreed to give us a practice game on the 7th. It was a close-run thing and highlighted a few issues with our list which we have since amended. In the tournament I'll be handling the cavalry and some support troops with Simon commanding the phalanx and its supports. I've also ordered some figures to make up a couple of units that we are missing (as well as some more Swiss halberdiers and a few C17th pikemen as standard bearers for my Buccaneers). I woke up on the 8th with a very rough throat, headache, extreme lethargy and legs feeling like lead-filled jelly. That continued into the Wednesday, but I started to pick up in the evening and afternoon. Since then I've been feeling rather tired in the evenings, so haven't managed to do a great deal when I've got home from work. Several months ago I won this game in a prize draw on someone's blog (sorry - I've completely forgotten whose). Simon and I didn't fancy a heavy gaming session on the 14th, so I suggested we give it a try and he insanely agreed. We did make a couple of mistakes in the first turn but were very quickly getting it right. It's certainly a fun game to play, with plenty of tactical choices to make. The version I won was an early one where the standard, boost and "mighty effort" dice are all white, which made it confusing at times to select the correct ones. EM4 Miniatures have since released sets where the dice are colour-coded. I'm strongly considering doing a few things to make game-play more easy in future - getting some of the colour-coded dice, replacing the the small cardboard tokens with slightly larger plastic tiddly winks and sticking the arena map onto card. I decided to start Donogh's figures from scratch again. This time I've gone with black primer. I'd managed to finish the first five by the 9th and was greatly relieved when Donogh said he liked the pics I'd sent him. I just need to give them a coat of Klear and then spray them with matt varnish. I'm going to try to crack on with the other five this week. I've also redone the base-colour of Simon's Spetsnaz. Once Donogh's figures are all finished I'll be working on these. 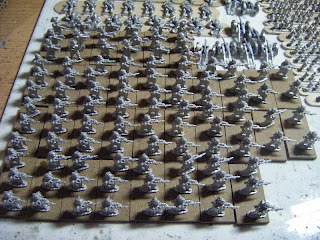 As I haven't felt like painting this past week I decided to do some grunt work and prep a load of figures. During the week I prepped the final (yeah, right - final my a**e!) bits for my 30 YW army - casualty figures for cohesion markers, 10 battalion guns and 6 artillery limbers. 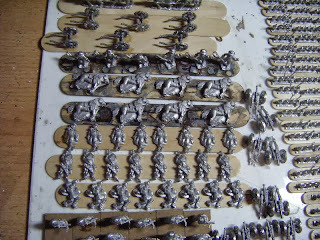 I've also prepped some more Koreans - 18 crossbowmen and 80 arquebusiers. Yesterday saw me with a lot of free time for doing some prep and thinking I didn't have anything to prep. Then I remembered my Baccus 6mm ACW armies. 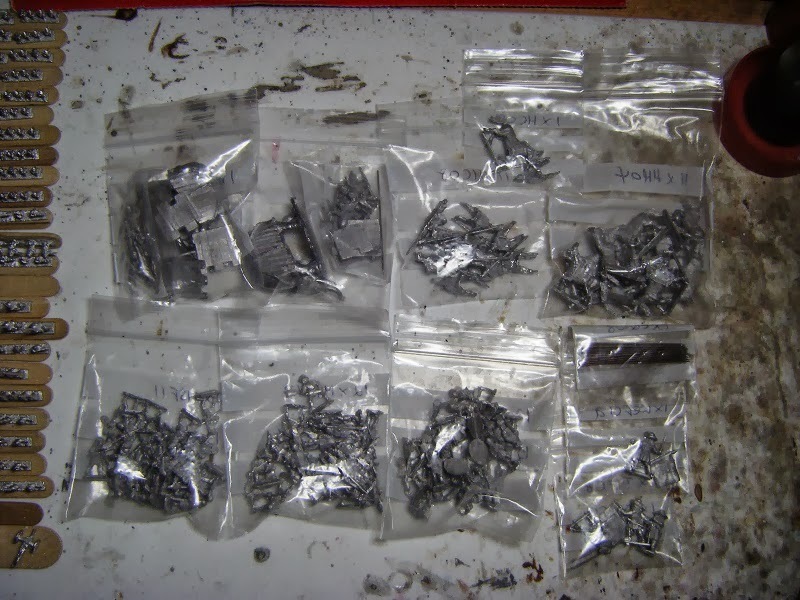 Fortunately these require very little prep as the castings are so clean - all I needed to do was a tiny bit of snipping and to file down the bases a bit to ensure that they were level (and not quite so thick). 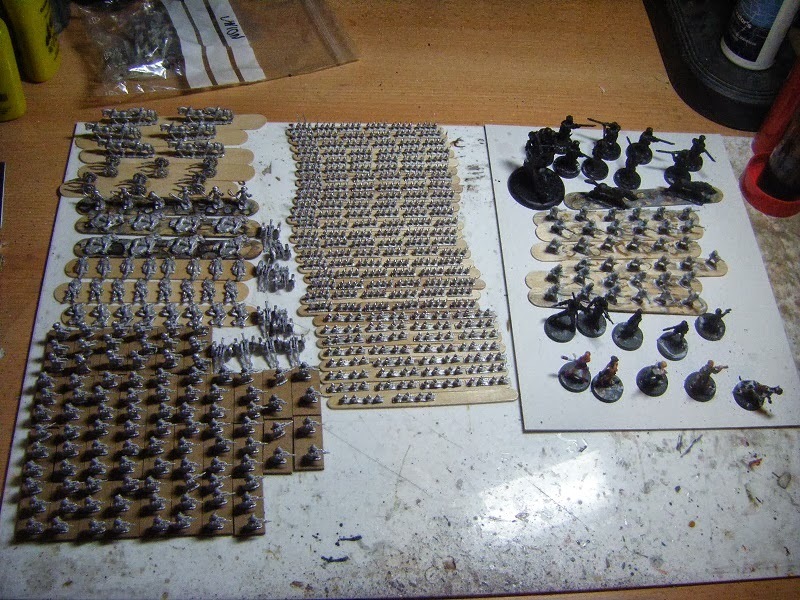 I managed to get all the prep for the Union forces done (20 x 6-strip infantry regiments, 30 strips of infantry skirmishers, 2 x 6-strip Zouave regiments, 4 strips of Zouave skirmishers, 7 x 3-strip mounted cavalry, 2 x 5-strip dismounted cavalry, 19 guns and crews, 6 command strips). 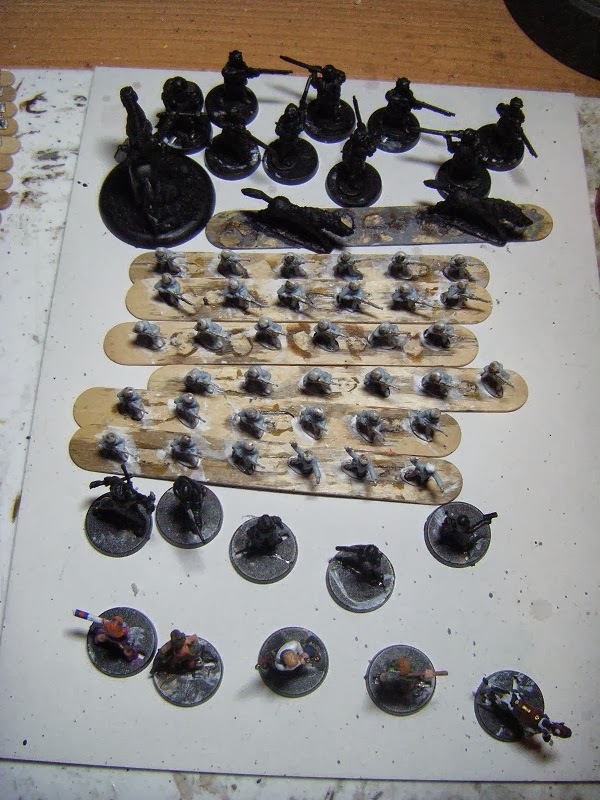 This afternoon I've stuck the infantry regiments and skirmishers onto painting sticks. 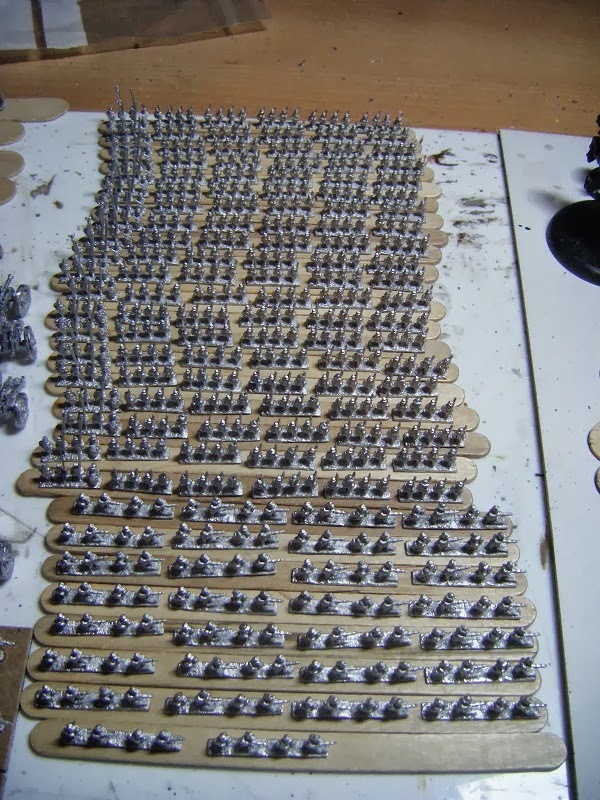 Over the next few days I'll be doing the prep on the Rebs. I'm going to need to think about how I will base these - 60x60 or 60x30 (30x30 for command and artillery), or do something else (20x20?) so that I can use them for other systems. Well, after that bunch of verbiage you deserve some pics! Teaser pic of the first 5 of Donogh's figures - I'll be doing a separate post this week with close ups. Sorry for making you wait for this one. Today's post is the fourth and final AAR from "Derby". My opponent was Bob Medcraft from the Oxford Team. I've met him before at Campaign and he's a great guy, so I knew it would make up for my horrible experience in the morning game. Bob won initiative and opted for Hilly terrain. We ended up with 3 steep hills, a piece of impassable terrain (a lake), 2 pieces of broken ground and an area of brush. Much of it ended up in Bob's half of the table, including 2 steep hills in what should have been an ideal position for him to take advantage of. Advancing on my right flank. I decided to commit both my skirmisher units to this attack, to try to deny Bob the hill on this wing whilst screening my 4 average units as they advanced. My block of superior troops in the centre, advancing slowly towards the fight between the hills against Bob's best troops. Meanwhile, I've sent 2 of my average units forward on the left flank to try to take that hill. Clash of the not-very-Titans. We've each managed to disrupt one unit at impact. Moving into the gap. Bob had pointed out something I'd been doing wrong in my earlier games, that chariots can't be combined with medium or heavy foot to form a battle line for movement. That is why the right hand unit is slightly behind the rest. "We'll hold here whilst those sluggards catch up"
On the left flank, one unit disrupted by enemy skirmishers. They'll be seen off soon enough and my gallant swordsmen will charge over the hill into his spearmen. On the right flank, I'm winning the skirmisher melee with one of his units already broken. However, I do appear to have a swordsmen unit about to be menaced by some chariots in the open. Gulp! My chariots and one unit of superior armoured swordsmen rashly charged in against Nestor's spearmen whilst the sluggards were once again, errr, sluggardly and didn't join in. That's half of Nestor's boys broken, very conveniently bursting through his chariots as they routed. My other superior armoured swordsmen with my chariots should make short work of the other unit. Those skirmishers have held on very well against mine, but are now fragmented and one base away from breaking automatically. My average swordsmen who had been providing some support on the flank have decided they can leave the javelinmen to it. And they've gone! Unfortunately my swordsmen were charged by some of his spearmen and double-dropped to fragmented in the impact phase. The other lot of Nestor's spearmen have broken, with my heavy chariots pursuing into contact with the light chariots. My right-most swordsmen have decided to try to force Bob's chariots back off their edge of the table. Oh, damn! I bet that this is where things start to go wrong for me. Oh crap, they'd routed through their rear support, disrupting them. Back to my left flank - the right flank is turning into a horror story. One enemy unit broken, one fragmented. Errr, didn't I have 3 superior foot units and some chariots here? How come I've only got two foot units in the centre now? Well, the answer is astonishingly simple really - my dice were terrible, Bob's were bloody superb and my chariots and a superior foot unit were wiped out. Not much left of Bob's right wing though. The two fragmented units on my right wing dropped to broken in the next melee phase, which meant I'd lost 6 battle groups (half my army) giving Bob the win. However, I'd also broken 6 of his battle groups, but as he had started with 13 I hadn't quite managed to rout him as well. The final score was 16-9 to Bob. It was a fantastic final game and I was oh-so-close to winning massively, only to be let down by awful dice rolls in the last two turns. Those of you have been paying attention will have worked out that this was my least enjoyable game of the tournament. I've just run this list through the army generator spreadsheet, and found it comes out as 833 points. I've double-checked against my photos and the list above is correct. My suspicion is that Rich may have submitted the list with just 2 Troop Commanders and accidentally (*cough*) deployed 3 during the games. Rich won initiative and selected Developed terrain. I made a bit of a screw-up here - I wasn't really awake and forgot that I could have selected 2 "open" pieces which might have prevented some of his terrain falling where it did. Unfortunately for me, most of it fell into his half of the table. Given that he was able to deploy his archers almost wall-to-wall across the table, I would have to commit some troops to a delaying action on one wing to prevent him from enveloping my army, whilst committing the rest of my army to advancing on one wing and hope that they didn't get shot up too badly on the way in. Again, this was where not being fully awake didn't help as I would need to waste some time repositioning my main line on the way in. Stupidly, I'd deployed my skirmishers over towards my right.so they wouldn't be able to provide much of a screen for my main thrust. My deployment - superior troops in the centre of the main line. The main thrust crawling gradually toward the Egyptian right wing and centre-right. If I could survive the shooting going in, the Egyptians would be mincemeat at impact and in the melee phases. Over on my right wing, the Egyptians are concentrating their shooting on just a few units. 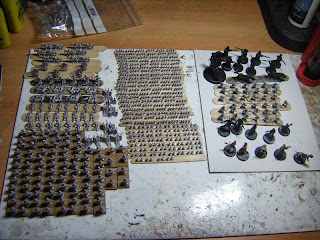 My superior troops massing to take on the Egyptian centre-right. Rich seemed to have 3 different-coloured sets of home made measuring sticks - red, green and yellow. I suspect that one was with short inches, one with normal inches and one with long inches, to be used according to which would benefit him most at the time. Almost there! Notice the two bases on the end of Rich's right-most archers, slightly ahead of the rest. In my previous move I'd moved exactly 4" forward which put me in base contact with them when they should have been just short. Rich threw a tantrum, so I moved them back to just outside contact. From the pics it is now clear that those 2 bases must have got knocked forward slightly, perhaps when he was checking ranges for shooting. He threw a couple more tantrums during that turn and the one after. It seems I stopped taking pics at this point. Over on my right wing, one of my blocking units had been broken from shooting; one had charged in against the Nubians in the field and were broken by his close fighters flank charging them (I can't find pics that show it clearly, but I suspect it wasn't a valid flank charge - I don't think he had a base which was fully behind my front but can't be entirely certain. However, at that point I'd lost the will to live from all the tantrums and let it go); another unit had been shot to fragmented and my chariots had lost 2 bases to shooting. Unfortunately we ran out of time just before my turn. If we had been able to play on, my left wing was about to charge in and destroy his right and centre, which would probably have won me the game. I suspect that all the tantrums were to deliberately waste time to prevent me getting onto that last turn. 1. Avoid playing against him again if I can. 2. Double check the terrain options - if I'd remembered the open terrain pieces, I might have blocked some of his pieces from going down. 4. A blocking force is just that. It doesn't need to be as big as I made it and it doesn't advance into combat until it has to. 5. Against shooty armies, having an IC would be really helpful. As you will know from my previous AARs, I really don't mind losing (even when it's a 25-0 wipeout). What I do dislike is losing to someone who appears to have cheated and thrown tantrums near the end to waste time in order to prevent me getting into contact and possibly winning. Do Gentleman (and Ladies) Prefer Blondes?